Pendrive, SD Cards or Flash drives are very common device to transfer data from one computer to another, sometimes we get errors while connecting Pendrive to Computer and during data transfer one of them is Shortcut Error, basically, this is a Virus known as Shortcut virus, it converts every file into shortcut in Pendrive / Hard drive, this article will guide you to remove shortcut virus from your flash drive as well as computer. What is Shortcut Virus and How does it Spread? When we connect a flash drive to a malware computer and transfer any file from PC to flash drive it automatically infect Pendrive and all files appears as Shortcut. This virus can affect any external storage like Flash Drives, External Hard disk, Phone Memory, Memory card or any Memory Stick, this is an anonymous malware which initially released online and spreading from one computer to another and we got Shortcut of files which are in USB drive if you try to open any file you will get error message. If your USB drive doesn’t have important files you can try to Format it, but if it contains important files then you are not going to format it. To Remove Shortcut Virus manually follow the Steps Below. Step 2. Navigate to Flash Drive by typing its letter. [ Let’s Say it is i ], to find your USB drive letter open “My Computer” and check for the letter, type i: and hit enter. It will take few seconds to recover all your files, Now open your Flash Drive you will get all of your files back. How to Remove Shortcut Virus Permanently from Computer. Once you recover files into USB drive you can use them but if you again plug in USB Flash drive into the infected computer your flash drive will infect again, so it is better to remove the source of this virus i,e infected the computer, follow the steps below to remove shortcut virus manually from the computer. Step 1. First open Task Manager by pressing Ctrl + Alt + del Or Right Click on the taskbar and click on Task manager. Step 2. Go to Process tab and look for process Wscript.exe, Scroll down and find any such process, Now Right Click on it and Click on End Task. Here look for Registry Keys “WXCKYz“, ” ZGFYszaas” “OUzzckky” “odwcamszas” if you find any of them then right-click on it and delete this registry key. If you don’t find exact registry key then look for similar registry keys and search them on google to know what they do. 1. Press Windows + R key, you will get Run box, type %temp% here and hit OK, now temp folder will be open look for file nkvasyoxww.vbs WXCKYz.vbs“, ” ZGFYszaas.vbs” “OUzzckky.vbs and delete it. 2. Go to C:\Users\<username>\AppData\Roaming\Microsoft\Windows\Start Menu\Programs\Startup. Check Startup folder if nkvasyoxww.vbs and other similar .vbs files exist here then delete them. 3. Press Windows + R key, type “msconfing” into the run dialog box and hit OK, it will open System Configuration, Go to Startup tab, and look for nkvasyoxww.vbs and other similar .vbs files uncheck them from startup and hit OK. There may be a different name for the VBS file, just make sure you don’t have any file with an unusual name and VBS extension at the startup, registry, and temp folder. If you follow the above steps you would be able to get rid of shortcut virus from your Flash drive and PC, but the latest version of this virus may not go from computer even you manually check and delete the suspicious files, so it is recommended to uses a good Antivirus to delete shortcut virus from your Windows PC. However, most of the people have antivirus software installed on their PC but this Virus may skip several antiviruses, the recommended and second opinion to the antivirus is Hitman Pro. Hitman Pro is an advanced malware scanner which does find the virus which is being skipped by installed Antivirus into your PC. 1. Download Hitman Pro, it comes free for 30 days with full functionality. 2. You may install it on your computer or can perform one time scan without installing the software. 3. After that perform a full scan on your PC. 4. It will find and delete all the found malware such as Virus, trojan, rootkit, bad registry entries etc. 5. Be careful while deleting the found malware, it may detect some important .dll files as malware remember to uncheck them. Now it will delete all the malware including the Shortcut virus. Shortcut Virus remover V3.1 is a tool to automate the above-mentioned cmd commands, if you are not familiar with CMD stuff then the remover software will help you to do it within few clicks. 1. Download Shortcut remover tool. 2. 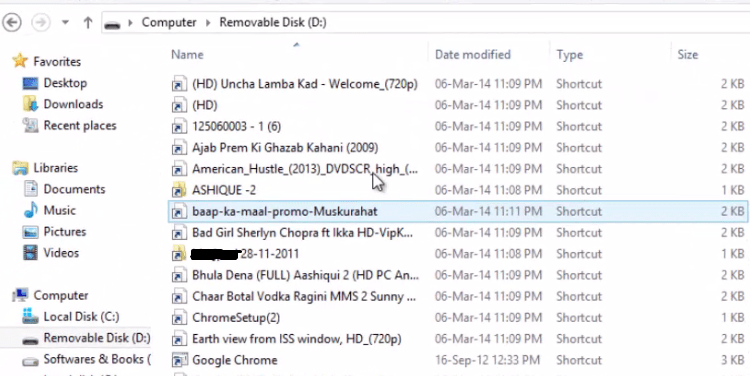 Extract the downloaded zip file using Win Rar or 7-Zip. 3. Install the software, you may need to restart the computer. 4. Go to your Desktop, find and run the installed program. 5. Now you just need to enter the flash drive letter and click on Clean Virus. 6. Hit the Yes button on UAC. Performing all the above steps will remove Shortcut Virus from your Computer or Laptop if you face any problem feel free to comment below. Make sure you have complete protection installed into your PC like Kaspersky Total Security or McAfee Total Protection if not please download and install Kaspersky Total Security/ McAfee Total Protection or any other antivirus which provide protection from all kind of threats. Or you can also install a good free antivirus program but be having a full version of an antivirus give you a piece of mind and you stay safe from different types of malware like a virus, trojan, rootkit etc. Hi, thank you a lot. For me, the first option of “How to Remove Shortcut Virus Permanently from Computer.” help me. Regards. It’s a very useful answer.. I was able to remove shortcut from my pen-drive following steps. Thanks a lot. Have two thumb drives infected with shortcut virus. Followed the removal instructions above to the letter – it plain doesn’t work! Thankyou so much. Your tutorial really helped me remove a short cut malware from my pendrive and PC. You are a pro. Thank you so much for the detailed guideline and explanations. It helps. God bless you. Thank you brother ibhave removed the virus from my computer using your method.The virus name in my computer was different but you method helped me i just deleted iexplore.vbs instead of the file you mentioned above. But it helped me thank you so much. My USB drive creates shortcuts even i done what your said. Thanks for sharing it really help me alot. this is awesome! i like this way of attribution! tnx men ! after all the steps in cmd all the short cut virus removed from usb drive. i eject it and it comes back again.